^ Bailey, L.H. ; Bailey, E.Z. ; the staff of the Liberty Hyde Bailey Hortorium (1976). Hortus third: A concise dictionary of plants cultivated in the United States and Canada. New York: Macmillan. ^ a b Milner, Edward (2011). “Trees of Britain and Ireland”. Flora: 134. ^ Humphries, C. J., Press, J. R., & Sutton, D. A. (1992). Trees of Britain and Europe. Hamlyn Publishing Group Ltd. ISBN 0-600-57511-X. ^ a b Sycamore. Niche Timbers. Accessed 19-08-2009. 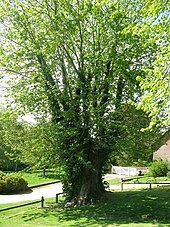 ^ Association of Scottish Hardwood Sawmillers (ASHS): Sycamore – Acer pseudoplatanus Archived 2014年8月27日, at the Wayback Machine. ^ Howell, Clayston (May 2008). Consolidated list of environmental weeds in New Zealand. 292. Wellington, NZ. : Department of Conservation. ISBN 978-0-478-14413-0. Video of the notable Auchenskeith Sycamore in Ayrshire.